The biggest challenge for me when it comes to staying organized is long term functionality. When you have six children with very different abilities, making things work for the long haul is hard! 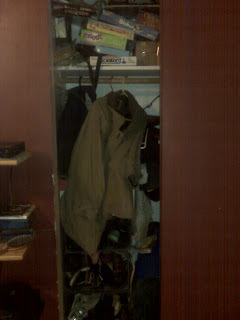 But, I have to say, we're over the hump on the closet and it is going great! Here are some pictures to refresh your memory. Please note the overflowing shoes, games about to fall, costumes, file cabinet that won't shut and what everyone needs in their closet...a broken air mattress and 50 deflated mylar balloons. and up close on my solution for the games. I am thrilled with how this is working out for us! The hardest part of the challenge for me was feeling like I was wasting my time. So often when I get the brilliant idea to organize something, it doesn't work for our family. The kids just aren't on board or D thinks it's craziness and without their support, I can't maintain things. I was able to overcome it this time! I'm excited! In order to make this work, I had to explain to D exactly why I was taking all the games out of the boxes and in to ziploc baggies. Turns out, he wanted to see how it worked for others first. I showed him pictures of people who made it work. I also had to lay out my plan for making it work for us. That means before I started on the project I needed to be organized! Habits and changes? First of all, I'm loving the idea of things labeled. Most of my kids can read now, so labels are extra handy. They know where the games go. They know where their shoes go. And, it's harder to get to the games, which is a good thing. They need to ask to get games out. So only one game comes out at a time. They can clearly see the pieces and what they need. No more rummaging around. This means less mess! What was broken was thrown away, like the air mattress. Other things, like the excess shoes and mylar balloons were given to charity. I prefer freecycle, but lately, no one is coming to pick anything up. My creative solutions were to use what I already had. I didn't want to spend a lot of money on something I didn't think was going to work. BTDT. This was probably my biggest limitation. I used plastic bags from the dollar store to hold all our game pieces (except for a few games). I placed those in fabric baskets I picked up on clearance and had never found a use for. 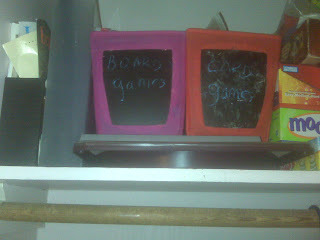 These baskets are great because they have a chalkboard on front for easy labeling. I didn't want to store my gameboards in a way that they would get knocked down whenever someone got the pieces basket out. I used a plastic cereal storage box I was saving because I lost the lid and was sure I could repurpose. And I know everyone has BTDT...holding on to something to find another use. I also needed to find a place to store my picnic baskets. They were getting tossed around in the "find it in the closet shuffle." I use them often enough that I wanted them accessible. The top of my shoe rack was perfect. And once the costumes were out of the way, they stayed put! I should win this challenge because of how this has had a trickle down effect in other areas of our home! 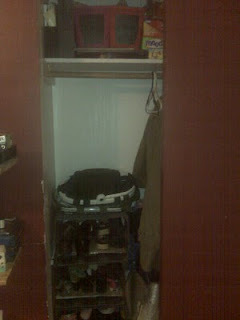 I was so surprised how just organizing the front closet has helped to organize other areas! The kids finally "get" the basket idea. It's enabled me to get more cloth dollar store baskets and find places for the toys that stay in the living room, organize our Wii games (they fit perfectly in the 6x6 baskets). Board books, blocks, mega blocks...everything in a basket and when it's clean up time, they put them away! 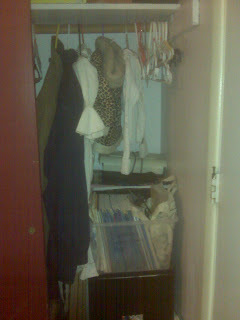 One of the unexpected benefits of having the closet actually usable was with our school uniforms. 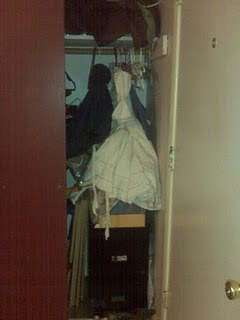 Each night, the kids hang their uniforms in the closet. When they get dressed in the morning, they pull the clothes out of the front closet and leave the hanger. Now, when I go to wash clothes, I don't have to try to figure out what they did with the hangers. I was constantly pulling them out from under beds, behind dressers, etc. My life has been made so much easier! When the older ones fold laundry, they now know exactly where to get the hangers! The overall effect this has had on our family and the fact that I was able to do this for a whopping $2 worth of new materials, is why I should win :) Organization on a budget that works for a large family. Great job! Your closet area looks wonderful. good job! I think you should win the challenge! great job! I love the bins.